A new review by our co-blogger Michael Bird has just been published in Review of Biblical Literature (here). On the web-page of the INTF (see "links" on the sidebar) another update ("Fortführung") of the Kurzgefasste Liste der griechischen Handschriften des Neuen Testaments (ed. Kurt Aland et al.) was posted in December, which reveals several newly registered manuscripts of the Greek New Testament. One of the recently registered MSS is the uncial lectionary L2435 which I happened to discover in the binding of L1126. I was going to collate Jude in L1126 when suddenly I saw on the first frames on the microfilm some obscure but visible majuscule text. Then I had to leave Jude for two days... With some deciphering, concordance-work, etc, I could identify the texts found both on the first and last pages in the binding of L1126, and see how the texts from Matt, Mark and Luke belonged in the same period of the ecclesiastical calendar. Windows has a feature called Extended Desktop which I think is a must-have for people working with the texts of the Bible in general, and Textual Criticism in particular. The feature allows you to view applications on an additional monitor. Digital photographs of manuscripts can be viewed at the same time as digital transcriptions. The setup is ideal for cutting and pasting, developing databases, and writing papers and emails in situations where there is a second digital document involved. The switching between applications which is otherwise necessary only serves to multiply errors and make these processes more arduous. Microsoft has an information/setup page here. Secondary CRT monitors are readily available with the advent of the cheap flat screen, so you can probably do this for free. Jan Krans announces here further additions to TC 12. Good to see more OT material. The Caesarean discussion in this week's blog opens up an interesting 'bubble' in textual history. Something is there, and early, even if not a full-fledged family like the Alex-Newtons or the Westerleys. For the meantime, this 'group' raises interesting readings at times. Gergesenes, et al., of Mk5:1, Luke 8:26, Mat 8:28 has been raised. Here is another interesting text with potential local colour. The Alex family is usually rejected as an assimilation to Mark, 'cepting WH. The West family is usually rejected as an assimilation to Psalm22 Heb. Do we credit the 'Caesarean Group' with a priority reading here? Anyway, I went that way in my November 2006 ETS paper. It may not be published for 2-3 years. So I have time to equivocate. "I am working on a project idea for Amy [Anderson] that is fairly open-ended, possibly about the "Caesarean text type"/texts physically connected with the city of Caesarea in the book of John. I had a couple of questions about this that I was hoping one of you could help with. First, what is the state of current "Caesarean" scholarship? Is this idea generally not accepted by mainstream text critics? Second, if there is a case to be made for a Caesarean text type, what manuscripts would be associated with it in the book of John?" The Fifth Birmingham Colloquium on the Textual Criticism of the New Testament will be held from 16-19 April 2007 on the topic: "Textual Variation: Theological and Social Tendencies?" We have mentioned this before on the ETC blog, but now a programme (including an interesting list of offered papers reproduced below) is available here (from where you can also find a booking form). Dr Philip Burton, 'Christian Latin' or, why revisit the Sondersprache Hypothesis? Hugh Houghton emailed: "If you missed the original call for papers and would like to offer a proposal, please let me know as soon as possible" (his email is also on the linked page: see 'Any questions may be addressed here'). So join the gang and offer a paper quickly. Well I know that there are some very clever people out there, so I wonder if you can help poor me with a bit of parsing. I've got a list of ten Greek forms and I wonder if people can parse them and also explain why they parse them as they do. Comments on any special features will be welcome. Please restrict your comments to one form per day. 3. παρειχαν Acts 28:2 v.l. I've just noticed Scripturetext.com an excellent resource through which to browse multiple Bible translations simultaneously. Vulgate and Aleppo Codex included. Maurice Robinson has (finally) agreed to join the blog. He is Senior Professor of New Testament at Southeastern Baptist Theological Seminary. His webpage is here. He is well-known as the editor of The New Testament in the Original Greek: Byzantine Textform, 2005 (reviewed here; order here), and also for his publications (e.g. here) adocating the Byzantine-Priority position. He has, I believe, collated all available manuscripts relevant to the study of the Pericope Adulterae (full publication still awaited; preliminary results in Filología Neotestamentaria somewhere), compiled indices to the Brown-Driver-Briggs Hebrew-English Lexicon and Thayer's Greek-English Lexicon. Ever philanthropic in publication he is also responsible for a widely-used freeware version of Westcott and Hort's edition of the Greek New Testament. For an interview with Prof. Robinson go to Dave Black online. I'm absolutely delighted that he has agreed to join us. He has, of course, regularly edified us in comments on the blog, but we now look forward to being edified through postings he initiates as well! "Why is it that, whereas this text is widely rejected as not original, it is widely accepted at Mark 1:41, οργισθεις rather than σπλαγχνισθεις? That is, apparently most recent commentators, although not the Nestle-Aland and UBS text, prefer here a reading which is found only in the Western Text." This topic is recently covered by Ehrman in Misquoting Jesus (pp. 133-139) where he cites his 'A Sinner in the hands of an Angry Jesus', in New Testament Greek and Exegesis: Essays in Honor of Gerald F. Hawthorne, ed. Amy M. Donaldson and Timothy B. Sailors (Grand Rapids: Eerdmans, 2003). Of course much is made of the fact that one cannot imagine a scribe changing 'compassion' into 'anger', whereas one can imagine the reverse. Moreover, we know from Mark 3:5 that Jesus in Mark could be angry. Matthew and Luke, who omit the word in their use of Mark, are further cited as authority that the word was distasteful. However, if Matthew uses Mark he often abbreviates him anyway. The same could be said for Luke. Accidental corruption is perfectly possible in Greek (and in Latin: autem miser(a)tus > autem iratus). There are many readings in D and the Old Latin witnesses that are difficult to explain but a great many scribal corruptions follow no pattern and therefore cannot be 'explained'. 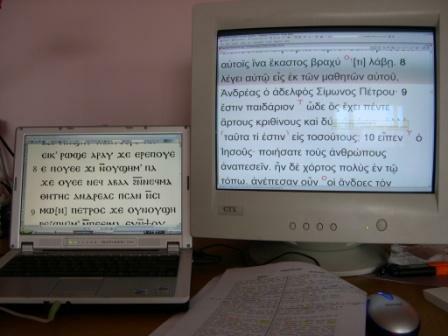 If the family of Greek textual groups has as ugly, red-headed stepchild, the Western text would have to be it. The better-known Alexandrian and Imperial Byzantine textforms are widely discussed and accepted as useful terms to categorize individual manuscripts. Attitudes toward and evaluations of the Western text vary. Working against the Western test is the fact that it is only evidenced by one Greek manuscript (D/05, Codex Bezae Cantabrigiensis). In its favour, supposed agreements in Latin, Syriac and perhaps other early translations argue that the sole Greek text is the representative of an entire lost tradition. I have been reading Albertus Frederik Johannes Klijn’s A Survey into the Western Text of the Gospels and Acts (Ann Arbor: University Microfilms, 1970), and have produced some questions. Please answer only one each per diem! Answered questions are blue. 1. In 1562, Theodore Beza was presented with the Greek-Latin manuscript which would bear his name. Where was the text of the Gospels and Acts (Cantabrigiensis) before it came to Beza? 2. How many columns does D/05 have per page. 3. Only one of the texts in Bezae is complete. Which is it? 4. Who adopted Bengel’s system of textual families and added the Western text as a third group in 1767? 5. J. D. Michaelis and Hermann Freiherr von Soden thought what ancient Christian figure was responsible for the harmonizations in the Western text? 7. In the Western text, the gospels come in what order? ea vel non omnino fuisse Graecae originis, sed tota, quanta quanta, traduisti de Latinis; vel saltem recensita et emendata fuisse variis sui patribus, ad Latinam versionem. 10. Codex Bezae contains remnants of what epistle? 11. Recently, the Latin text of Cantabrigiensis has been deceitfully used in what pop-culture phenomenon? In favour of the latter option may be the fact that Paul will have arrived in Corinth himself (16.3 first phrase), so can be given a personal and verbal recommendation, no letter of recommendation is needed for him (although perhaps it might be thought that the letters of recommendation were from the church in Corinth to Christians in Jerusalem). In v4 he appears to be uncertain as to whether he would be able to accompany them, so letters of recommendation from Paul would have been appropriate. Any thoughts on the punctuation in the manuscripts? Or the exegetical issues? J. Warren Wells has provided Bohairica 1.0, the free Bohairic text of the NT in addition to Sahidica 2.0. I've bought a hard copy of the Sahidica text. Excellent for QTs! Holger Szesnat, ‘“Some Witnesses Have ...”: The Representation of the NewTestament Text in English Bible Versions’. Szesnat reviews the treatment of variations in NIV and REB concluding that they and other versions share a number of patterns of misrepresentation of textual evidence. Tobias Nicklas on Luke Timothy Johnson, The Acts of the Apostles. 2d ed. (http://rosetta.reltech.org/TC/vol12/Johnson2007rev.pdf). What's the best (preferably free) software for drawing a stemma? Keith Elliott reviews Bart Ehrman's Studies in the Textual Criticism of the New Testament here. I have an enquiry from a scholar wishing to find out whether there is a list of all Greek manuscripts with the Gospels in the 'Western' order. Does anyone know of such a list? Reflecting on the international development of this blog, I'm thinking that despite the varied membership of the blog the links are probably too restrictively anglophone. There may be very good sites on textual criticism that we don't link to because they are in languages such as Korean or Chinese to which current members of the blog do not (to my knowledge) have access. Given that we do have readers from 6 continents, can anyone suggest any links in languages other than English that should be added to the sidebar? It will be easy enough to find people to evaluate them. If such pages do not exist in major languages (e.g. Russian, Spanish, Arabic) then I would heartily encourage readers of this blog to develop them. I am delighted to announce that J.-L. Simonet has joined the blog. He is currently working on textual criticism of the Acts of the Apostles—collating Greek and Syriac minuscules and lectionaries, and Armenian mss and lectionaries. He has recently discovered a new witness of the Vetus Latina of Acts (he may or may not wish to share details) and has collated a number of Vulgate mss too. He is also studying the oldest Ethiopic ms of Acts. Beyond that he's gathering data from translations made from Latin in the Middle Ages in Dutch, German, English, Swedish, Provencal, Castillian, Catalan, Portuguese, and Italian. In addition to the languages indicated in this research he also has Arabic, Coptic, Georgian, and Old Church Slavonic (it's hard to do without OCS nowadays :-). He is currently preparing a doctorate in Louvain-la-Neuve on the citations of Acts in Gregory Nazianzenus, Greek texts, Latin and Oriental translations, while also preparing the edition of Gregory Nazianzenus Oratio 41 (on Pentecost) in the Armenian translation. This edition should appear in CCSG. He has a long record of pastoral involvement and is currently President of the French-speaking Evangelical Federation of Belgium (as he has been for many years). A friend of mine who has been a missionary in Belgium says that he played a very significant role in getting state recognition for evangelical churches within Belgium. Soyez le bienvenu, Monsieur Simonet! This further enhances representation of European countries on the blog: Euro-bloggers currently come from, Belgium, Germany, Netherlands, Sweden, UK. However, bloggers only come from N. America, Europe and Australia, though one currently resides in Israel (which is allowed into the Eurovision Song Contest because the judges had not consulted an atlas to see which continent it was in). Qualified bloggers from other parts of the world are most welcome. Call For Papers: Papers concentrating on any aspect of the practical work with manuscripts of the Bible are welcome: managing variants, computer assisted tools, preservation techniques, evaluating the evidence of versions, papyrological insights, technical developments, social historical studies, scribal habits, producing critical editions, new projects, systematic-theological problems, teaching text-criticism in an academic setting, etc. The Call For Papers closes 15/1, so hurry up! More details and submission area at the SBL site here. In the comments to that post Maurice Robinson said that he did not regard the hypothesis of multiple autographs as necessary. The possibility of multiple autographs was particularly argued by Ehrman in Misquoting Jesus, giving Galatians as the prime example. After all, Galatians is an epistle written to multiple congregations and Ehrman suggests that it is therefore likely that each congregation would have received its own copy. It occurred to me that Ehrman appeals to Galatians because it is the case that prima facie is most likely to require multiple autographs from the perspective of delivery. However, Gal. 6:11 suggests that there was a copy of the letter that would have displayed a distinctive form of Paul’s handwriting and seems to assume that the recipients would have had access to this. Thus rather than supposing that Paul and his amanuensis in the heat of passionate correspondence anticipated the number of copies of his letter that would be required and produced that number of autographs, we should suppose that they produced one autograph which was circulated to each congregation, with the potential for it to be copied in each location. Thus, ironically, what Ehrman regards as the strongest case for multiple autographs gives rather strong evidence for a single autograph. Some other cases for multiple autographs (Mark, Luke, John) struggle with the fact that the two ‘versions’ of the book produce conflicting literary analyses. Tim Finney is writing a book and its progress can be viewed here. In the third chapter he particularly tackles the question of how to judge whether agreement between two witnesses is coincidental or genetic. ESV: Or do you suppose it is to no purpose that the Scripture says, "He yearns jealously over the spirit that he has made to dwell in us"? RV: Or think ye that the scripture speaketh in vain? Doth the spirit which he made to dwell in us long unto envying? The second half of the verse is usually treated as a quotation, marked in the margin of NA27 with 'unde?' But if one assumes that the readership of James knew their Scriptures well enough to realise that what follows is not a quotation and that, therefore, it must be a second rhetorical question, this way of punctuating the verse may be not completely far-fetched, as the RV shows. Interestingly, though the punctuation affects translation, it is omitted from the punctuation apparatus of UBS4. I have just received notice from the retailer (www.bokus.com) of my recently published book, The Epistle of Jude: Its Text and Transmission (ISBN-10 9122021590), that the excessive cost for shipping was erroneous and has now been corrected. The former price including shipping was USD 93 for customers in the US, but it is now corrected to USD 52. Quite a "discount!" The book can be ordered here. There are English instructions how to order. What's Special about Evangelical Textual Criticism? To start the New Year we have the following contribution by James E. Snapp, Jr., on a subject that is of central concern to this blog. Textual criticism, like most branches of science, resists theological classification. The term “evangelical textual criticism,” used to describe the analytical task of reconstructing the original text of the Old Testament and New Testament books, may seem like merely a secondary name for the textual criticism of the books upheld as holy Scripture by evangelicals. However, four distinct features of the text-critical approach used by evangelicals, taken together, separate evangelical textual criticism of the books of the Bible from some other kinds of textual criticism. 1. An evangelical textual critic approaches the text with a sense of religious reverence. He understands his task as a basic exegetical step, establishing and confirming words which God, through human agents, provided for the guidance of the church. 2. An evangelical textual critic approaches his task as a restorative enterprise rather than a creative one. He aspires to add nothing to the original text, and subtract nothing from it. Evangelical textual criticism is a science, not an art. Conjectural emendations are entertained only where the extant readings are manifestly unoriginal. The evangelical textual critic, when presenting Hebrew, Aramaic, and Greek Biblical texts intended to represent the original text, formats any conjectural emendations in the margin or apparatus-notes. He never places a conjectural emendation within the text. 3. An evangelical textual critic defines the original text of a document — that is, in normal language, the original text of book or book-set — as the contents of the document in the form in which it was first issued (as something distinct from whatever sources it may have had). He acknowledges that authors, revisors, editors, and arrangers may have contributed to the production of a document, while also acknowledging that whatever textual alterations occurred subsequent to the initial issuance of the book as a distinct document constitute unoriginal, uninspired, and unauthoritative material. He also accepts the possibility that the initial issuance of some documents involved multiple autographs, and regards the contents of each autograph as original, inspired, and authoritative, even where differences of sense among the multiple autographs occurred. He may, when reconstructing the archetype of such a document, present closely contested readings within a variant-unit not as rivals but as brothers, both of which may be regarded as part of the initially produced message. 4. An evangelical textual critic harbors the belief or expectation that the doctrinal message of the Hebrew, Greek, and Aramaic texts through which God has communicated to the church in many places, and for many years, is not materially different from the doctrinal message of the autographs. This belief or expectation accompanies, but should not interfere with, the text-critical task.